I must admit to a certain hedonistic streak when it comes to bathing, be it a long hot soak in the winter or a wonderfully cool and refreshing shower in summer. So when we decided to update and renovate an existing powder room, we did not want to settle for a standard shower configuration. Ultimately, we opted for a custom shower design. But that’s jumping to the end of the story. Let’s start from the very beginning. The original working area was fairly small, measuring about 32 inches square, and we had no expectations that we would be able to fit a tub-and-shower combination in the space. Once we completed the demolition, however, we were delighted to discover an extra 18 inches with which to work. That would certainly be enough space to permit a more elaborate shower enclosure than we initially anticipated. We began shopping at various kitchen and bath stores to come up with ideas, although in the back of our minds, we kept comparing all of the new options to a unique solution that we briefly enjoyed in the early ’80s. Back then we lived in an 1870 Victorian home, which boasted a lovely, six-foot-long soaking tub and a separate tiled shower enclosure. The shower enclosure was quite innovative for the time and featured three rows of jets spaced at knee, back, and head heights along the three walls. When you turned the jets on, you were completely enveloped in multiple sprays of water. We had never seen anything to compare to this luxurious approach. And now, as we examined various shower wall panels, multi-jet heads, and body spa approaches, we couldn’t find anything that would re-create the same shower experience… until we happened to pick up a custom shower design workbook from Grohe. It was an “a-ha” moment for us: If we couldn’t find a current product to rival our remembered bliss, then we could actually design our own custom shower system. Taking the brochure home with us, we began working out angles and possible layouts. We soon learned that the most important aspect of designing a multi-head system is the control valve. To provide enough water flow to power multiple heads, Grohe recommends a ¾-inch valve (even if you only have ½-inch water pipes). We were lucky enough to have ¾-inch water pipes coming to this bathroom, which simplified the process, and before long, we’d come up with our dream custom shower design. It was time to meet with a plumber. Because we live in a city, all plumbing projects must be handled by licensed professionals. We went over our plan, and the plumber determined how much space would be required to run the extra water pipes for multiple jets, and how many on/off knobs we would need. We settled on three body spray heads on the back wall, positioned at knee, back, and head heights, all controlled by one knob. There were also be a fixed overhead spray with a separate on/off knob, plus a handheld spray wand with its own on/off knob, designed with a pole mount allowing it to move up or down (the latter comes in quite handy for washing the dog!). One critical factor we had to consider in our custom shower design was the total flow rate of all the shower heads combined. 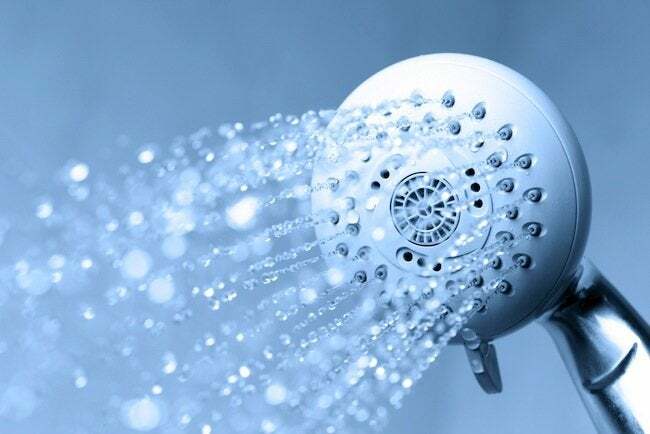 By way of example, the Grohe shower heads have a maximum flow rate of 2.5 gallons per minute, and since we wanted five shower heads, our total flow rate would be 12.5 gallons per minute. The control valve has a flow rate of 16 gallons per minute, so a single valve was perfectly adequate to meet our needs. Had we wanted to install more heads, we would have had to go with an additional valve, but we felt that would be overkill in a modestly sized shower stall. 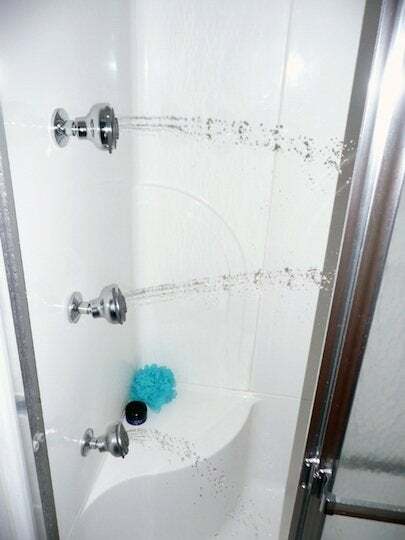 Once we had worked out the layout of the shower heads and had figured out the necessary plumbing runs, we were left with an enclosure measuring 46 inches by 32 inches, more than enough width to allow for a small shower seat. 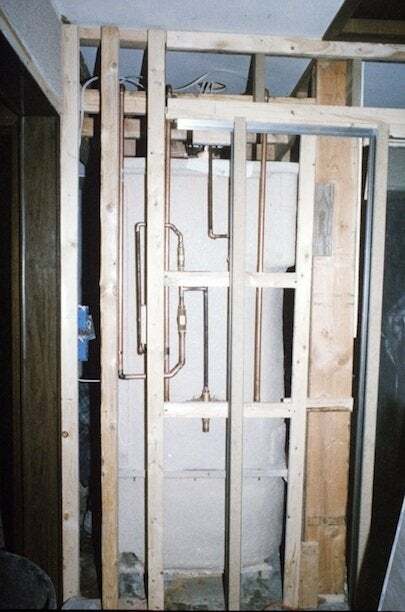 We chose a molded fiberglass enclosure for ease of installation, because we felt it would be beyond our skill level to integrate all of our fancy plumbing into conventional tiled walls. The end result has been a dream, a truly indulgent and personalized shower experience.